This country house, is surrounded by beautiful countryside, it's located in a very quiet area. Approximately 1km from the old town of Pollensa. The house is fully equipped. Pollensa and Puerto Pollensa: The picturesque countryside around Pollensa is a colourful mixture of fertile fruit orchards and lightly wooded glades, bordered by hills to the south and dramatic rocky outcrops of Mallorca's northern mountains. Contained within ten square kilometres, the region stretches along the coast to Alcudia from the golden beaches of Puerto Pollensa and inland to the quaint, historic small town of Pollensa itself. To the north the shores of Puerto Pollensa and Alcudia are fringed with kilometres of golden sand with water sports and ideal sun bathing for the more relaxing holiday. Both Puerto Pollensa and Pollensa offer a good selection of restaurants, ranging from cafes and tapas bars to fine dining. Pollensa, apart from its pretty square has the Via Crucis which is a notable attraction with its long stairway which ascends Calvary Hill, from which there are superb views over the coast. Puerto Pollensa is a pretty, unaffected resort that is a firm favourite with families. Mallorca: It is easy to understand why Mallorca is a firm favourite with holiday makers of all age groups. From the beauty of the stylish resorts such as Puerto Pollensa and Alcudia along it's northern shores, to the more hectic lifestyle of the west coast and the golden coves of Cala D'Or towards the south, this wonderful island allows you to be as lively or relaxed as you want to be. This Balearic Island is one of fantastic contrasts, mountain ranges, unspoilt coves, sophisticated resorts, beaches, cities and beautiful rural country side. Peace, comfort and stunning views. We loved the good sized pool , and even at the beginning of May were able to swim, with only a few moments to get used to the unheated water. We didn't really cook there, as we went out for our main meal, but there is a full sized oven and a microwave. No baking tins, so you couldn't do cakes. We found that most restaurants catered for Gluten Free, with El Giordano on Pollensa square, producing a lovely g- free baguette for me! The vegetarian restaurant (Bellaverde) in Puerto Pollensa, even did really creative vegan meals, making them Dairy free too, plus gorgeous soups and inventive desserts, many of which are gluten free. The choice of excellent restaurants of all types is amazing in the area! We used Trip Advisor to find those that suited us. La Cabana, on the sea front in P Pollensa, has a Gluten free Tapas menu. The shower has good water pressure and instant hot water. Once set, the temperature didn't fluctuate. You just had to remember which way to turn the taps! Guillem was very responsive to requests for info or help; the electricity went off once, and he was there within 20 minutes to inform us it was a local power cut, so all would come back on soon. The beds are extremely comfortable, and we found everything we needed in the quality house. There is no longer a sheet changing service mid way through a two week holiday, as some folk have previously reported. You have to do it yourself. Second stay at this wonderful villa - don't bother looking elsewhere if you are after peace and quiet, a fantastic large pool, wifi that works and 'Ned' the donkey in the field next door. No need to wrestle with parasols; drag your sun loungers under the trees and relax in the spectacular countryside. Don't forget the roof terrace for a spot of star gazing at night too! Thank you for another lovely holiday. Guillem and Antonia's villa is a perfect retreat for a family break in Pollensa. This small but perfectly formed accommodation has everything you need - two ample bedrooms (both with twin beds), well-equipped kitchen, comfortable living space, and small but well appointed bathroom, plus a washing machine and drying rack on the back terrace. The outdoor space is what really makes this place though - beautiful pool area with steps down to the pool, a good sized shallow end for younger kids, and even a fun jacuzzi area in the pool. In the day time, the trees around the pool provide welcome shade on the terrace, and at night the pool lights make for a great atmosphere. The views of the mountains all around are truly awe-inspiring. The kids loved feeding carrots to the friendly donkey in the next field, and wandering among the lemon trees. The roof terrace also affords wonderful views of the valley. Just 20 minutes walk into Pollensa old town and a short drive from supermarkets and beaches - this is simply a great location! We will be back! Our family of four stayed at the fab villa for 12 days, and loved it so much we are returning this year. Pictures do not do the villa justice, everything you could need. If you want glitz and glamour, maybe not for you, but for our family it was perfect. It's location is amazing, set in beautiful countryside, on a very large plot. There are neighbours spotted around the general vicinity, but not in your direct line of sight - the villa is located at the end of a dead-end road. Study the map well before you travel - we did and located the villa first time of asking. An easy 20 minute stroll into Pollensa centre - take a torch for the walk home. Guillem and wife were lovely and friendly, provided you his mobile number in case there was a problem. Would recommend this villa to those who want a peaceful relaxing holiday in amazing surroundings. the owners were very helpful and quick in responding to any question we had. They came and changed towels/sheets once a week as well. 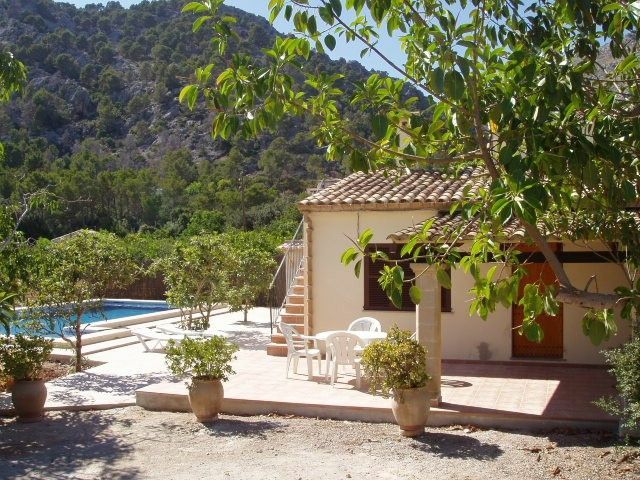 The villa is located in quiet back roads a good 20 min walk from the main square in Pollenca. A suitable distance for working up an appetite or walking off a good dinner. Wifi is good bonus for those with teenage children and works well. Pool is a good size and warm. BBQ and washing machine work a treat. air con is a real bonus on the hot nights - get a lesson on how to use it. we used bikehead.se for bike hire - they found the villa easily enough to drop off and pick up bikes. Wow! What a wonderful holiday, thank you so much Guillem and Antonia. We have just spent a wonderful week here and would have no doubt in recommending it to anyone else. The villa is a good size for four and the bedrooms spacious. The lounge looks bigger than the photo and the kitchen is well equipped with a small table, big enough to all sit round for a meal if it gets too hot outside. Outside is beautifully kept and very pretty. The pool is amazing and warm in August, (we spent up to 4 hours a day in it), with a fun, push button jacuzzi at one end). On our arrival we found the whole place, inside and out, very clean and well swept: terrace, pool, villa (in and out) and the beds comfortable with clean linen and plentiful clean towels. The location is the best ever. We walked down (20 minute pleasant and easy stroll) into Pollensa every evening for dinner or during the day for shopping. Pollensa itself is pretty, clean, interesting and with lots of good places to eat and shop. We met Guillen twice and he is lovely and speaks excellent English. There is plenty to do on Majorca. We had a couple of days out (we had a hire car), but were otherwise more than happy and occupied to stay in and around Pollensa. The local supermarket (next to Lidel) is good, a nearby beach we found and liked (although busy and small) was at Cala Vincenz. We visited the caves at Arta (worth a trip, although not as spectacular as some of the others (according to the guide book). Being British we couldn't help but take pity on the stray cats, who multiplied in number over the week, from one to five, after word got round there was Whiskas on offer! I just couldn't resist their feed-me faces any longer! However they did respond to shooing if you didn't want them. If looking for anything to advise about, the shower runs from the taps so takes a little practise to balance the temperature and make sure you put food in the fridge as, being a dry country, you do get ants (something we are not used to in the UK!) These are minor points and did not detract from a great week here and my top advise would be to hurry and book! book! book! This holiday will stay with us forever, thank you. Pollensa is situated on north coast of Mallorca. Golf: The Pollensa Golf Club is open to non members. The challenging 9 hole courses have been described as some of the most beautiful in the Mediterranean, with a clubhouse, a restaurant which also welcomes non-golfers, a swimming pool, rental of clubs, trolleys and golf cars also available. Tuition can be arranged and there are regular tournaments.